Unhappy clients are a bad sign in the business world. There are always going to be individuals who give you a hard time. However, if clients are consistently voicing their displeasure, it’s likely that you’re at least partially responsible. Getting a few bad ratings from dissatisfied clients will affect your ability to acquire new ones. You need to keep your clients satisfied to stay in business. Here are five tips for running successful client campaigns. You can’t use the same kind of campaign for a perfume company that you would use for toilet paper. Every client will have different needs. And for that reason, you need to approach each client with a different perspective. There are a few reasons why this will benefit you. Clients want to feel like they’re special. You will make them feel that way if you’re giving them a fair amount of individualized attention. Make sure you let them know all the ways that you’re working specifically for them. If a client feels like you’re giving them a generic treatment, they’ll simply work with another company that will take their individual needs more seriously. Key performance indicators (KPIs) are how you can quantify the success of a client campaign. Make sure you are recording data throughout the entirety of the campaign so you can show the client how paying you helped them. It’s essential that you use business intelligence tools to compile and synthesize KPIs for your client’s ease. Two of the most important KPIs to most clients are customer lifetime value (CLV) and customer acquisition cost (CAC). But the exact KPIs you highlight will largely depend on the client and their industry. Word of mouth and peer-to-peer sharing are ways that help campaigns spread like wildfire. However, neither of these things will happen if you don’t do a little bit of promotion on your own. Clients will expect you to spend a good amount of time promoting their campaigns, and it’s fair for them to want this out of you. The way you promote a campaign will largely depend on the client. If it’s a brand aimed towards younger people, you will want to promote on a social media site that caters to people in that demographic. Utilizing social media influencers is also a great way to promote a campaign, as people are generally more trusting of individuals than brands. It’s unlikely that your client’s campaign will be a hit if it doesn’t excite people. Whatever you’re offering, it needs to entice engagement. Otherwise, your client will be sore at you. There are many ways you can get people to participate in a campaign. One of the best and most cost-effective ways is to offer some sort of shout-out as a prize. This will only work if you have access to a heavily-followed media channel, but it can work wonders for getting people excited. If you’re going to offer some sort of monetary prize, make sure it’s something unique—or at least presented in an interesting way. You don’t want to run a campaign that’s just you are giving away money for no gained customer loyalty to your client. 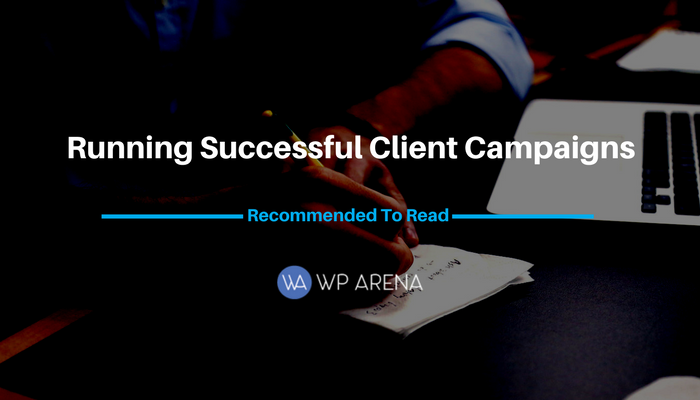 Even if everything else goes wrong with a campaign, if you end up with a long list of emails that lead to highly targeted potential customers for your client, you can call it a success. Email marketing is one of the most cost-effective ways to reach customers. Make sure your client understands the value of being able to reach people in this way. It can be stressful running a client campaign. However, if you keep these factors in mind during the planning stages, you will help your client hit a homerun.